Sign up for the Reindeer Run today! 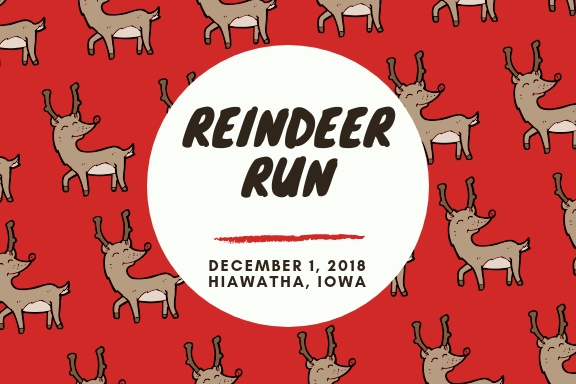 Join us for the second annual Reindeer Fun Run/Walk December 1st, 2018 at 9am in Hiawatha! The race will start and end at Fay M. Clark Memorial Park (located at the north end of 18th avenue next to AirFX). Each runner will receive a stocking hat with their registration fee along with Hot Cocoa, Candy Canes, Subway Cookies and SANTA when you cross the finish line! Registration is $20 per participant, $25 the week of the race. Proceeds from this event will be put towards a new pet fountain at our upcoming Hiawatha Dog Park. Come join the fun and help raise some funds for new park amenities! The Friends of Hiawatha Parks and Recreation Foundation will also be having a food drive for HACAP food reservoir during the race! Bring your non perishable items to donate to a family in need in your community!